Steven Kane received an award from the Midwest Crossroads Alliance for Graduate Education and Professoriate (AGEP) in the late spring semester of 2008. Steven has been working on his doctorate under the guidance of Prof. David Koltick at the Purdue University Applied Physics Laboratory (APL). His dissertation is a study on the effectiveness of detecting special nuclear materials in sealed maritime cargo containers using neutrons as an interrogation beam. The award entailed a monetary prize in the amount of $3000, to be used for travel and research. 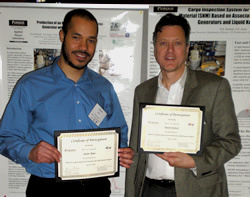 The funds were used for travel to Oak Ridge National Laboratory for experiments and to two conferences, SORMA West 2008 in Berkeley, California, and CAARI 2008 in Fort Worth, Texas. Steven was recently recognized at the AGEP Midyear Faculty and Student Recognition Banquet and Research Poster Presentation on April 9, 2009. The Midwest Crossroads of AGEP is comprised of Purdue University, Indiana University, and Northwestern University. These schools have partnered to develop a strategic plan to increase enrollments, improve retention and prepare and encourage minority students to enter the academy. The key elements of AGEP are recruiting, retention, and enrichment.